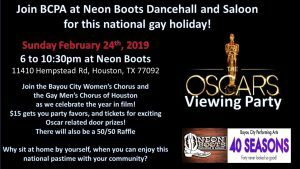 Come join the Gay Men’s Chorus of Houston and the Bayou City Women’s Chorus for an unforgettable Oscars Viewing Party at Neon Boots! $15 at the door gets you party favors and tickets for Oscar-related door prizes! There will also be a 50/50 raffle, so don’t miss out! Proceeds of the event go to support the Gay Men’s Chorus of Houston and the Bayou City Women’s Chorus.